I’ve spent a small fortune on birding gear, but the most published image I ever snapped was taken with a cheapo rig. Shot in jpeg. Using AI servo at f/8 when the camera was designed to autofocus down to f/5.6 only. Worse, the image was underexposed because I was in Av priority and I didn’t have time to dial in some exposure compensation. 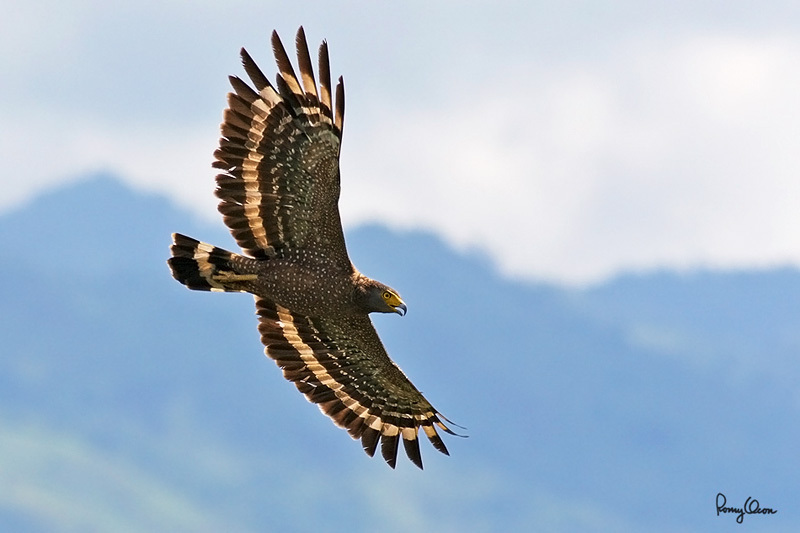 I was standing on a ridge at Subic rainforest when I espied this raptor soaring nearly level with my position. Most of the shots were out of focus, as the ancient AF system of the 20D saddled with a non-reporting 1.4x TC could barely focus on a static subject, much less at a bird in flight. But in one critical frame, when the eagle banked with the distant Zambales mountains as background, the sluggish AF locked on magically and I got a decent shot. This is one good example of a modest rig at the right place and time being better than a state-of-the-art gear with no photogenic shooting opportunity. Habitat – Forest from lowlands to over 2000 m.
Shooting Info - Subic rainforest, Bataan, Philippines, June 2, 2005, Canon 20D + EF 400 5.6L + Tamron 1.4x TC, 560 mm, f/10, ISO 400, 1/1000 sec, hand held.